Andy Goldsworthy’s Rain Shadows fascinate me. 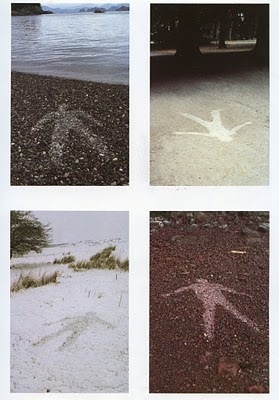 Like much of Goldsworthy’s work, it is the human story that draws me. How long does Goldsworthy lay on the ground as the rain soaks his clothes, his skin? What does it feel like? What does he think about? Does the waiting drive him mad, or is this an act of meditation? Do passersby gawk or offer assistance? How does he know when it is time to rise? For some artists nature is the setting of their work. For others nature is the subject. For Goldsworthy nature is like family. I am tempted to write “collaborator” or “fellow worker,” but these do not convey enough intimacy. He feels the ground at his back; he is exposed to the wind and the rain. He knows the world as he knows his body. Like St. Francis who calls the sun his brother and the moon his sister, Goldsworthy has a large family. The wind and the rain conspire with Goldsworthy to make works of art that are full of wonder and grace. The shadows hover like ghosts upon the ground and they profoundly speak to us about what it means to be human. Living in a world of change, we are creatures who long for permanence. The photographic records of his shadows are like moments outside of time – residue of human existence – that capture this desire. Waves of time and weather erode the actual Rain Shadows and they remind us that our time is fleeting. The Hebrew word for vanity is hebel. More literally it is translated as “vapor” or “breath.” It is itself a kind of shadow; a misty reminder of life and presence. It is also the name of Cain’s brother, the first victim of fratricide. His blood cries out from the ground. Our time is fleeting. We may feel that the important things in life are permanent and universal, but Goldsworthy’s Rain Shadows challenge us to cherish the ephemeral. This is true not only of his Rain Shadows, but of Goldsworthy’s work as a whole. Goldsworthy discovers the grace of God in nature: in an autumn forest, in a frozen river or in a rocky shore. There is no corner of God’s creation that does not praise his handiwork and Goldsworthy leaves no stone unturned. Although Goldsworthy does not profess the Christian faith, we may see in his work a witness to the theology of the incarnation. In a changing world where all is vanity, the Creator has graciously become a creature. Stepping into our temporal world for a mere three decades, the Son of God lifts up the ephemeral and shows us that even here we may see and touch and know the grace of God. Andy Goldsworthy: Rain Shadows. The Rain Shadows were produced at various moments in the artist’s career and in a variety of environments, both rural and urban. These ephemeral works do not last for very long and the only records we have of them come in the form of photographs. The first Rain Shadow was produced on the rocky shore of St Abbs, Scotland in June of 1984 and the second one was produced in August of the same year in the softer earth of Haarlemmerhout, The Netherlands. Copyright © Andy Goldsworthy. Andy Goldsworthy was born in Cheshire, England, in 1956 and currently lives in Penpont, Scotland. He studied at Bradford School of Art and Preston Polytechnic and has been making art in the environment, both rural and urban, since the mid-1970s. Goldsworthy has produced more than 70 exhibitions and projects all over the world including the Canadian Arctic, Digne, France, the streets of London and Tochigi Prefecture, Japan. Goldsworthy is often identified with a late 20th-century movement known as ‘Land Art’. His work explores different aspects of the relationship between humans and the land through a creative process that is both personal and intimate. Jim Watkins teaches Humanities and Bible at Veritas School in Richmond, VA. He holds a PhD in theology from the University of St Andrews (supervised by David Brown), an MCS in Christianity and the Arts from Regent College and a BA in Studio Art from Wheaton College. He is currently working on a book titled Creativity as Sacrifice: Toward a Theological Model for Human Creativity in the Arts (Fortress Press).